** HERE IS A PICTURE OF MY "NEW" 1997 Z50J 3OTH ANNIVERSARY, MONKEY BIKE ** SORRY NOT FOR SALE*, THE PAGE TAKES A MINUTE TO LOAD, PLEASE WAIT-- THANK YOU !!! Above is a picture of my just purchased 30Th Anniversary, MONKEY bike, Not sold in the U.S. and kept for show (in my living-room ONLY.) 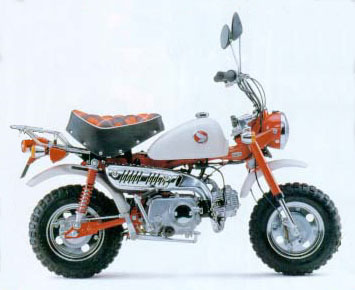 And my latest project, coming up, is that I am building a copy of this bike, using a 1978 soft tail, painting it Red/White, and adding the correct headlight, as well as the luggage rack, turn signals, horn and various other items to make it as complete and authentic as possible, including correct wire harness, and a battery as well. Wish me luck!!! I will keep you posted with pictures on progress. E-Mail me for more information PLEASE! !